The book builds upon the town of Westbrook, introduced in Beginnings: Westbrook, thus making the setting even more useful. It contains three full adventures and three lairs. The full adventures are all linked, providing a sense of continuity and purpose for players. The lairs are independent and therefore perfect for that extra encounter to round out a session. Publisher's blurb: "Theron Hawksfar, Westbrook's town master, isn't convinced that all is well in his town. Several farm folk have reported sightings of creatures scampering about and causing trouble. Now, the bodies of several murdered hunters have turned up near the little reptilians' home deep within the South Forest, and two children have been taken. With the impending arrival of the Jurithian Tradesmen, Hawksfar wants the wood tamed. 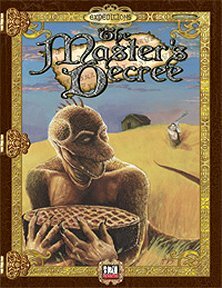 "The Master's Decree, the second release from 3am Games, is set in the great forest that grows just south of the town of Westbrook. It continues the adventures of Beginnings: Westbrook, carrying adventurers into an unexplored part of the town's environs."